I am stoked to head to Mammoth specifically! It is one of my favorite places on the planet. And I have literally not been snowboarding since BEFORE I started triathlon (aka sometime prior to 2007)! That is insane to me! 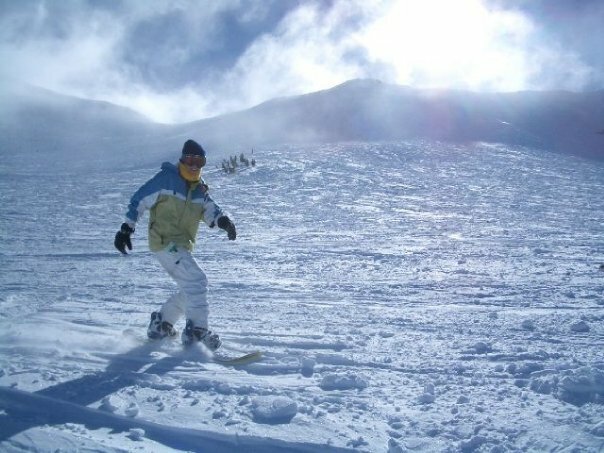 I used to love snowboarding and was actually pretty darn good if I do say so myself, but I gave it up when triathlon took over -- I started putting my money toward races rather than lift tickets, and investing my time into SBR not the slopes. Me. This is one of my all-time favorite pictures, from one of my all-time favorite days at Mammoth! Early 2000s I think? The funny thing is, I'll be wearing that same outfit this weekend. There is another reason why I am taking the opportunity to go to Mammoth, too; a very "scientific" one haha. It will be my first chance this year to get a taste of altitude exposure. That matters because this sea-level-livin' girl will be doing Ironman at over 6,000ft this September and that ain't something to just brush off. I'm having flashbacks of environmental exercise physiology in grad school in which I learned all the physiological ramifications of exercise/racing at altitude for someone not acclimatized. In addition to snowboarding, I do plan on getting in some training too. Should be interesting! I do know that come September I will not have the luxury of going to Tahoe at least two weeks before IM, which would be ideal for acclimatization. One reason for that is a little prior engagement I have in Vegas ;) So it will be good to see how I do with acute exposure this weekend. As of this past week, life presented an interesting opportunity that will have me on a slightly different path than I expected this year. It's one of those situations where I feel like I need to go for it and take advantage now while I can, so when I look back there will be no regrets. It's not all smooth sailin, though. Signing with the agency means I'll be taking on a large amount of driving again. Back and forth to LA and SD on a very regular basis. Yesterday I think I spent 4 hours total in my car. Usually you're on the road at the hours you don't want to be (although, I guess that is any time in LA). And there's also no doubt that I will have to make some sacrifices with training at times, which will be tough. But modeling won't be a daily thing, and I'll just have to be on top of scheduling and getting creative with training. Heck, I already did just that this past week... I had a meeting at the agency, and John came with. We took the bikes and got in a nice ride after. Not to mention, we made a pit stop at the Bonk Breaker headquarters to chill for a bit! Pit stop on our ride to enjoy a Bonk Breaker and the scenery. With my babe on the Malibu Pier. So we shall see! Should be an interesting year. For now, it's time to swim, run, bike, pack, make rice cakes, then wake up bright and early for some road trippin up the 395! Congrats on the modeling!! And we did the same little sneak away to altitude for a quick trip - went to Flagstaff and the Grand Canyon. Yeah, it's like breathing through a straw. Will you be at Interbike before Tahoe? Because I will and I hope you're there too!